When your friend tells you there is a brunch place that serves Kalua Pork Benedict, you go. You just go. The lines at Moena Cafe are well-known so even though we thought we got there early on a rainy morning, there was still a decently long wait. No matter - we were in good company. The menu sounded delicious from what we read so it was difficult to decide finally on what to get. Good thing we had the wait outside to figure it out. There are several signature items here so we made sure those made it to our list. This small restaurant is known for its unique breakfast items done well and with a mom-and-pop feel to it. Once we got seated, we knew we were in for a treat. To start, I had a fresh glass of their Passion Orange Guava juice which was quite refreshing. Then I popped in my order: Fresh Corned Beef Hash ($13.95 - with potatoes, onions, and eggs served any style) with eggs done sunny-side up. I have a soft spot for corned beef hash for some reason and they made sure not to disappoint here. The potatoes were done well, and the meat had nice crisping to it. I liked that it wasn't overwhelmingly salty as corned beef hash can tend to be. The eggs were made perfectly too; I expect no less from a place that focuses primarily on breakfast! 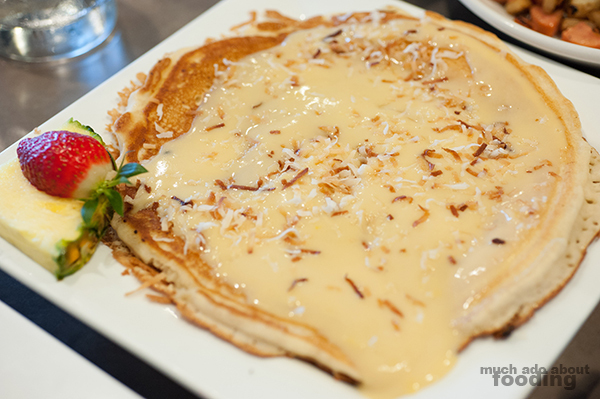 I also split their famous Banana Chantilly Pancakes ($12 - topped with toasted coconut) with a friend but we ended up ordering just the $9 petite stack which was plenty of pancake already. Smothered in a chantilly cream, the banana pancake was sweet and fluffy already but made even more decadent by the sauce. Toasted coconut just gave some beautiful texture to the bites as overall, it was very much a melt-in-your-mouth type of dish. No wonder this is one of their beloved dishes - I'd come back just for it! Other orders at the table included Hawaiian-influenced Kalua Pig Benedict ($13.95) and Short Rib Loco Moco ($15.50 - tender braised short rib over rice with an over-easy egg) which had flairs of Hawaiian traditional cuisine with some upgrades. 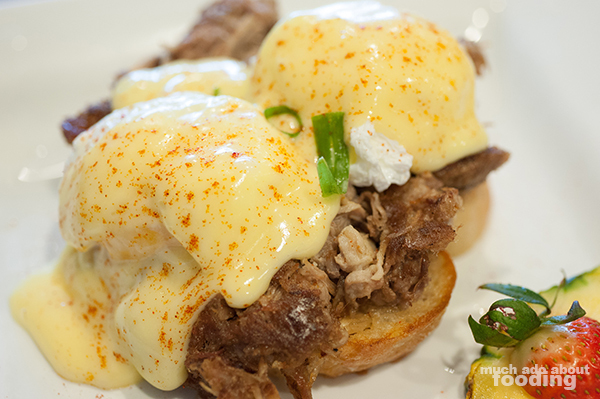 The benedict came with hefty servings of kalua pork which were seasoned well though a little on the dry side; the runny eggs on top helped once you burst the yolks. The delicious hollandaise also helped here. 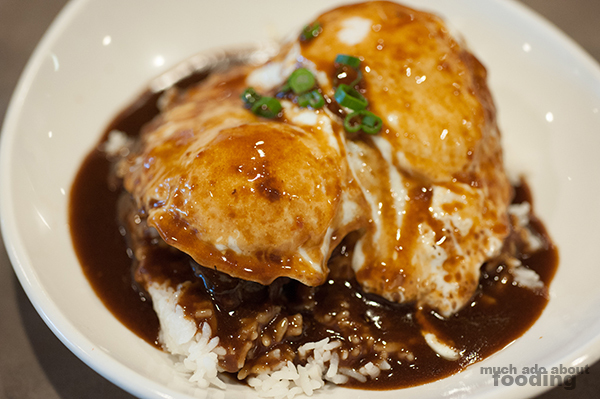 As for the short rib loco moco, you wouldn't have thought someone could amp up loco moco even more but they did here by throwing short rib into the fray instead of a hamburger patty. Granted, it was a tad on the saltier side but as a whole, the gravy was very good and the eggs cooked to just the right amount of doneness too. 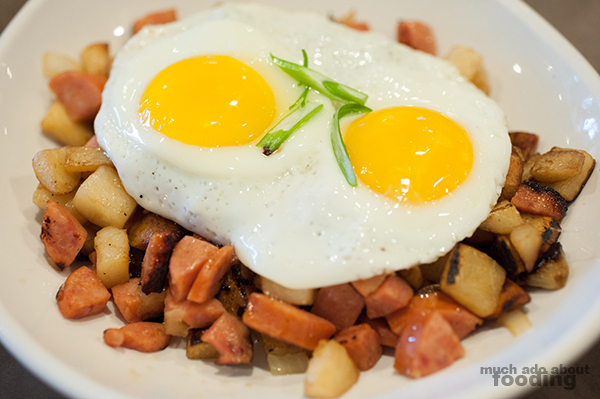 Overall, this is a great breakfast/brunch spot and it's not a surprise that so many Hawaiians love it here as well!